You have arrived at the largest Golden playground in cyberspace! On the web sinav to both educate and cheer the soul. And, now we are creating exciting media to raise funds for research in comparative oncology. 100% of this donation will be provided to Dr. Modiano, Director of the Animal Cancer Care and Research Program, College of Veterinary Medicine, University of Minnesota. Comparative oncology is the study of those cancers that occur similarly in people and companion animals in order to identify treatments and cures that benefits them both. A distinction to comparative oncology research is the fact that disease is never induced in the animals being treated. That is, the cancer has only occurred spontaneously. Humans and dogs have been linked in a mutually beneficial relationship since the Stone Age, when man and dog first joined in the hunt. Dogs share our homes, food, and affection. As it turns out, they also share much of our genetic code and suffer from many of the same kinds of cancer. That's why the clinicians and scientists of the Animal Cancer Care and Research (ACCR) program at the University of Minnesota are joining with dogs in another type of hunt—the search for a cure for cancer in both dogs and humans. "Veterinarians have known for years that humans and their dogs have many types of cancer in common—non-Hodgkin lymphoma, prostate, lung, breast, and bone cancer, and melanoma, to name a few," Dr. Jaime Modiano explains. "Yet, it wasn't until the dog genome was decoded in 2005 that scientists could begin to reap the rewards of studying cancer in both dogs and humans to their mutual benefit, bolstering the emerging field of comparative oncology." Dr. Modiano directs the College of Veterinary Medicine's Animal Cancer Care and Research program and holds the Alvin S. and June Perlman Endowed Chair in Animal Oncology. He also is a member of the Masonic Cancer Center, Univ. of Minnesota, a National Cancer Institute–designated comprehensive cancer center recognized for its research, treatment, and education. Breakthrough research (published in Chromosome Research in February 2008) arising from a highly productive and long-standing collaboration between Dr. Modiano and Dr. Matthew Breen, professor of genomics at North Carolina State University College of Veterinary Medicine, proved that cancers in the two species aren't just similar; they are virtually the same. At the University of Minnesota, research in comparative oncology bridges the College of Veterinary Medicine and the Masonic Cancer Center. The research will help advance the understanding of the biology of cancer and create new therapies to treat cancer in both humans and dogs. When the feline genome is decoded, cats will aid in the effort, too. Bringing dogs into the cancer research mix offers huge benefits, chief among them speed. Dogs live into old age, but their life spans are compressed, which allows researchers to see the progress of cancer and the effects of different types of treatments 7 to 10 times faster than in humans. That allows rapid completion of clinical trials. Canine Freestyle, as defined by the Musical Dog Sport Association (MDSA), is "a dog sport in which training, teamwork, music, and movement combine to create an artistic, choreographed performance highlighting the canine partner in a manner that celebrates the unique qualities of each individual dog. It is built upon the foundation of a positive working relationship between a dog and handler team." In competition activities, both the dog and handler are judged on their performance. A sport that focuses on teamwork, it so strengthens the bond between you and your furry companion. And, similar to that of the team sport of agility, you have the ability to encourage your partner to follow along with you. But, it is important to understand that Canine Freestyle is not 'doggie dancing', a term often used by the media to describe the phenomenon. Ann Priddy, MDSA Vice President, speaks to this very issue. "I'm not a doggie dancer. I'm not much of a dancer of any kind. What I do with my dog is canine freestyle. It is a sport. A sport at which I train and compete and I have a lot of fun doing so. It is a sport where my motivation is to show the world what a wonderful DOG I have and the relationship we share. Its up to me to choose how I want to present the sport to the public. I don't want to do anything that would place the sport in a position of being ridiculed or made fun of. Canine Freestyle is a tangible illustration of the intangible link between a dog and a handler. It is a link forged through training and built on trust. Through the medium of movement paired with music, Freestyle exemplifies the joy, willingness and teamwork that defines the canine human bond. When these elements come together successfully the results are magical. I think each organization has its own take on how freestyle should look. Some are more into the handler performing dance type moves. That's great. People can find where they feel comfortable. MDSA is not moving in that direction. MDSA's emphasis is on the dog. I choose to put the the dog in the spotlight. She is the one that should be allowed to shine. Polly will never be an OTCH, she is not some fantastically trained border collie. I am not Gene Kelly of Eleanor Powell. I am not Doris Humphrey or Martha Graham. I am simply someone that has a dear little dog who gives heart heart and complete trust to me every time we enter the freestyle ring. I never want to her feel 'cold there in my shadow'. I respect her for the special being that she is. I don't want her overshadowed by me or my movements. Its not about me. Its about celebrating the wonderful bond I have with this special creature that has been entrusted to me. I want to present that celebration in a way that is artistic and creative and pleasing to watch. Every choice I make, from music, to movements, from where in the space I perform certain moves to what I wear ... all these choices are made with the goal of showcasing this treasured dog and the special bond and partnership we share. The joy I have received back from her cannot be measured." While you may be able to keep a beat, trying to move along with your dog and have both of you in tempo is not an easy task. This is due to the simple fact that you are using two legs and your dog four to make up the same distance. And, it can be a tough task to find that perfect piece of music  one that fits your dog and that he or she likes moving to. We have taken freestyle classes and witnessed the differences in a dog's movement when various pieces of music were played. There are two major styles or schools that provide competitions for the sport of Canine Freestyle: The Canine Freestyle Federation (CFF) and the World Canine Freestyle Organization (WCFO). The CFF primarily focuses on the dog and the dog's movements. The WCFO shows greater focus on handler costuming and movement, and seeks a variety in movements from the dog. 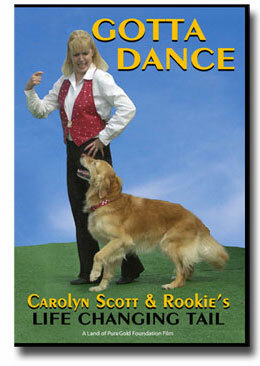 The newest school to the sport is the Musical Dog Sport Association, Carolyn Scott one of its original founders. Freestyle can actually have far-reaching utility. We have taken Darcy and Alfie 'on the road' to perform at senior and assisted living homes in Howard County, Maryland. Seniors are very accommodating and never mind you using food cues while working. In fact, they love seeing how you actually teach the moves they are seeing. MDSA's Spirit of Sharing Program recognizes teams using canine freestyle as part of community service related activities. This includes visits to hospitals & nursing homes; educational demos at schools, libraries, or preschools; performances at humane society fund-raisers; and, other such activities. Enabling folks—from 2 to 92 to experience the bond between dog & handler and to feel their joy—is a wonderful way to brighten the lives of others. To participate in this program, first become a MDSA member. Then, download the Spirit of Sharing log sheet, fill in your visits, and mail the completed sheet to: Jo Monfort, 1170 N Wapak Rd., Lima, OH 45807. Supervisor ignatures or initials are not required, although, you may include them if desired. Certificates and awards are provided for reaching 25, 50, 75 & 100-visit milestones, your team further recognized for this selfless contribution via The Spotlight newsletter. For further information, email Jo Monfort. Debi Davis, who lent her expertise to our project, challenges us all by her unwavering spirit in the face of adversity. 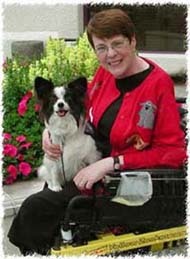 Debi has a service dog due to a vascular insufficiency and being a double leg amputee. Because bending over makes Debi dizzy, her dogs have been trained to do the physical lower level tasks, such as picking things up when she drops them. 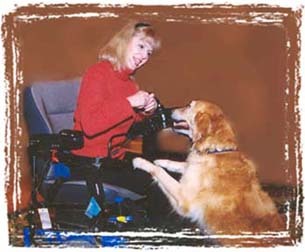 In 1999, her Peek won the Delta Society's Beyond Limits National Service Dog of the Year Award, the first toy breed dog & click trained dog in history to have won this honor. We filmed Debi, along with Carolyn & Rookie, during the P.A.W.S. for Service Dogs' first operant conditioning Service Dog Seminar specifically for Mobility Assistance Dogs. It was inspiring to see the melding of freestyle and service dog training, as both share in their application of positive motivational training. And, how heartwarming it was to see service dog persons experience the pure joy that only moving this way with your dog can provide! In order for Carolyn to have a better understanding of the particular needs and possible moves for persons dancing from wheelchairs, she was given a motorized chair to work from. Once she figured out how to drive, she experimented with Rookie. Amazingly, this Golden gem never missed a beat, easily working along her side, chair and all. Freestyle is a sport in which feedback is very important. Obviously, it is hard to know how you are coming across to the audience . . . . without one. That is why learning in a class setting is optimal. Hopefully, as interest in the sport grows, more and more instruction will become available. In the meantime, enjoy our comprehensive collection of Freestyle resources, fun video clips, and more! GRCA 2007 Workshop: "Git It!" Do dogs dance to music? Get in Step with your Dog!